I was left with no option; my next door neighbours have moved taking the UHF link with them so now I am the proud owner of a WiMax link that in theory gives me 1Mbit/s broadband. It was probably just fortuitous that one of the bigger ISPs in Zimbabwe, ZOL (that’s Zimbabwe OnLine to you South Africans) has splashed out on a lot of fibre optic cable and declared a price war by uncapping all internet subscriptions albeit at the not-so-fast 1Mbit/s. The technician who installed the hardware admitted that ZOL had probably got the fibre cheap as elsewhere in the world the trend is for 4G wireless links. But who am I to complain? I am pretty sure it’s not really 1Mbit/s but so far it hasn’t been too bad and yes, I can actually watch low res YouTube videos without them stopping to fill the buffer. On the way back to work I came across this tractor setting up for a demonstration for an upcoming field day. 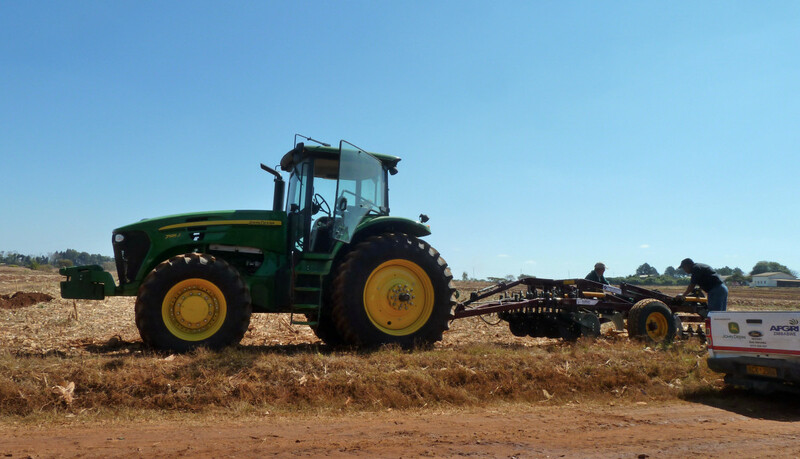 The implement looks fairly standard for this part of the world but the tractor is certainly high-class. I wouldn’t know what it would cost but like most things in Zim it would not be cheap. Even less certain is how it would pay for itself in our dismal economy or even who could get a loan to buy one. An awful lot of farmers in this country are on farms for which they don’t have title deeds so they have no effective collateral to get a loan – not that the banks are accepting title deeds as there is no guarantee that they could even sell or hold onto a repossessed farm. That could all change in tomorrow’s general election. We could get a new government that is interested in property rights, human rights and just about any other rights one can think of. Unlike the election of 2008 which the incumbent government lost but still managed to hold onto power, this one has been relatively free of violence. So far. Sort of progress I guess but no-one is saying that there is not going to be a massive re-adjustment of the result.